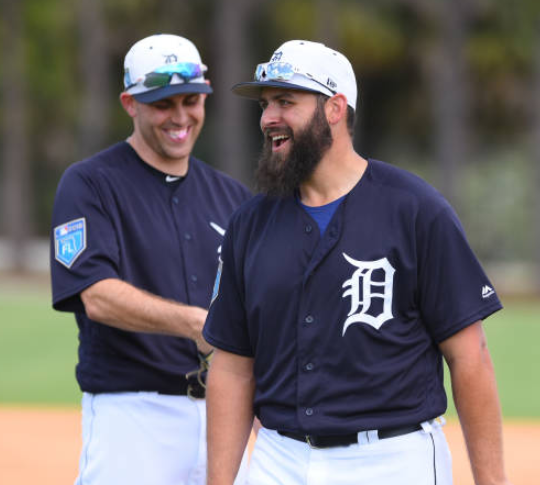 At the time of this writing, one month into the 2018 season, the Detroit Tigers have the fifth best starting rotation ERA (3.61) in the American League. This is a true statement, based on facts that I just now looked up to verify. It is a true statement, even though this team was supposedly going to lose 100 games "easily." It is a true statement, despite the fact that the Tigers have been letting Jordan Zimmermann pitch games for their team, on purpose. So let's figure out what's going on. He has five starts under his belt, and in four of the five he went 6 IP or better, with just 1 ER in each of those games. In the remaining game, he couldn't complete four innings, got knocked around, and cost me a lot of fantasy baseball points, so we will never speak of that game again. His 6.5 K/9 strikeout rate is below average, as is his 31% ground ball rate, so guess what that means? His fly ball rate is way, way above the American League average, so he's getting a lot of outs by way of the airborne stuff. That will work for the time being, I suppose, especially when he's pitching at Comerica Park, but it would be nice to see a few more strikeouts for sustained success. Oh hey, speak of the devil, look who's next. The ace of the staff is doing what he does: pitching deep into games (averaging around 6 IP per start), being stingy with allowed runs (somewhere around 2.5 runs per start, earned or otherwise), and doing it all while somehow staying well under the league average strikeout rates. Where Boyd gets a ton of fly balls, Fulmer is generating an above-average number of ground balls, and limiting his hard contact. Other than that, their numbers look eerily similar, and together they've formed a two-headed, ambidextrous, half-bearded monster worth 2.62 ERA, 1.166 WHIP, 3.78 FIP, 6.6 K/9, 2.9 K/BB, and a .242 BABIP against. So, it says here that Mike Fiers is a pitcher. I think. Strikeouts? Sorry, he ain't got none. Walks? Nope, none of them either. Hard contact? Some, sure, pretty much the same as everyone. Dingers, then? Ayup, got a few of those. But it's not like Fiers has a ridiculously high home run rate. We're talking 1.6 per nine innings, as opposed to 1.1 as the league average. Line drive rate is down, fly ball rate is just a tick above average, hard contact rate is even just a tiny bit below average. Oh, but you just know those dingers are coming. Those dingers are sooo-ho-ho-hooo coming. One thing I like to do when I think a pitcher might be particularly bad is to start comparing his numbers to Anibal Sanchez. So let me put it this way: Anibal Sanchez gave up 29, 30, and 26 bombs in 2015, 2016, and 2017, respectively; Fiers in those same seasons gave up 24, 26, and 32, so the three year total makes it 85 to 82, with Sanchez having just the slightest of sad, sad advantages. Anyway, this is about starting rotation ERA, and Fiers is at 3.91 for now, so let's check out our last two contestants. He's probably just between injuries right now, but at the moment Francisco Liriano owns a 3.38 ERA, making him the fourth Tigers starter to come in under 4.00 for the season so far. Like Boyd and Fulmer, Liriano is going consistently deep into games, has a low K/9 of 6.4 (have I mentioned that the starting rotation owns the sixth-worst K/9 rate in baseball? ), with ground ball and fly ball rates just above the league average. Unlike Boyd and Fulmer, Liriano is walking an above-average number of batters, but he's keeping those line drives and home runs to a minimum. His FIP is telling us a story, and that story is "he'll soon be giving up a full extra run per start," but for now let's enjoy the delicious creamy center of this unsustainable hot start. Ok, how do I explain this so that I don't accidentally throw up half-way through? Five Tigers starters have allowed 55 runs so far, and Jordan Zimmermann is responsible for a third of that. He's basically allowing enough runs for himself and an entire other pitcher, how does that sound? Jordan Zimmermann alone costs the Tigers three places on that ranked list. I don't need to review the numbers, they're all ugly, from the high line drive rate to the low ground ball rate, from the too-high fly ball rate to the way-too-high hard contact rate. If you look at his numbers since joining the Tigers and compare them to Anibal Sanchez's 2015-2017 campaign, Zimmermann is actually worse than Sanchez in many categories, and equal with Sanchez in others. And he just got a raise from $18 million to $24 million this year. So what's the point of all of this? Do the Tigers really have a Top 5 Starting Rotation in 2018? Of course not. But they're having fun with some bad teams right now, and April wasn't a total goat rodeo, so let's call it a win, shall we? Beers are on you next time.